(Nanowerk News) Organic compounds containing double or triple bonds can pack a powerful punch. By sharing electrons between atoms through a process called pi conjugation, unsaturated molecules often have exceptional photonic and electronic behavior, making them essential components in state-of-the-art products such as polymer light-emitting displays. One way to boost the usefulness of multiply bonded materials is to add heavy elements other than carbon into organic frameworks. Now, Kohei Tamao and colleagues from the RIKEN Advanced Science Institute in Wako and Kyoto University have developed a size-controllable molecular ring system that enables double bonded silicon–phosphorus units (Si=P) to be securely incorporated into pi conjugated networks ("π-Conjugated Phosphasilenes Stabilized by Fused-Ring Bulky Groups") – unlocking previously unseen photo-absorption and emission activity. 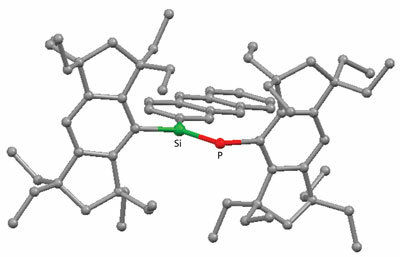 Figure 1: Molecular structure of the Si=P double-bond compound containing the anthryl aromatic group on the silicon atom (Si), and showing the high coplanarity of the pi-framework enforced by the two perpendicularly fixed bulky ‘Rind’ groups. Because Si=P bonds are extremely reactive, chemists typically attach them to geometrically large molecules known as bulky ligands that protect the double bonded elements. Unfortunately, most bulky ligands cause the Si=P double bond to twist, disrupting the critical pi conjugation. Tamao and his team designed a new type of bulky molecule—the so-called ‘Rind’ ligands—to address this rotational problem. Based on a rigid, symmetric skeleton of three fused rings known as s-hydrindacene, Rind groups also contain alkyl side chains that can be tailored in length to control ligand bulkiness. Adding Rind ligands to Si- and P-based starting materials produced molecules with highly coplanar Si=P bond with aromatic groups on Si that maintained pi conjugation in the solid state and allowed a unique room temperature fluorescence to emerge (Fig. 1). According to Tsukasa Matsuo, a co-author of the study, the Rind ligands interlock with each other to enforce the favored planar geometry for pi conjugation. 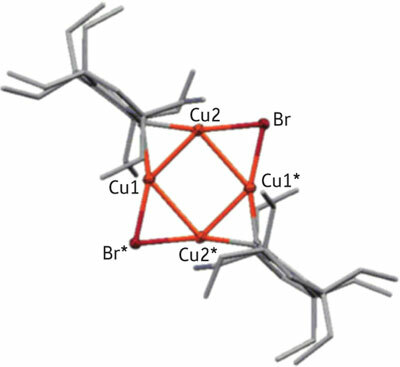 Figure 2: Schematic of the molecular structure of a new symmetric hybrid compound containing copper (Cu) and bromine (Br) atoms in a planar arrangement, stabilized by bulky ‘Rind’ ligands (grey frames). The researchers also discovered that Rind ligands produced startling results when used to stabilize molecules containing copper atoms and organic groups ("Isolated Monomeric and Dimeric Mixed Diorganocuprates Based on the Size-Controllable Bulky “Rind” Ligands"). While organocopper compounds are extremely useful in synthetic chemistry, their structures remain largely unknown because of continuous aggregation and dissociation processes in solution. By intoducing Rind ligands to copper bromide, the team isolated stable compounds containing remarkable internal architectures, such as four copper atoms arranged into a planar square (Fig. 2). “We were surprised when we found the beautiful structures of the organocopper materials,” says Matsuo. The four-copper framework also gave new luminescent qualities to these complexes—another reason why the researchers are continuing to explore ways to make functional materials using innovative bulky Rind ligands.